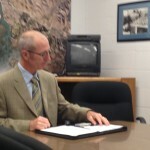 Morro Bay Mayor Jamie Irons filed a response Monday to the recall effort levied against him. Last week, a group of Morro Bay citizens filed a notice of intent to circulate a petition to recall Irons. The mayor spurned the recall effort by attempting to fire City Manager Andrea Lueker and City Attorney Rob Schultz. Irons defended his approach to the personnel dispute in his response to the recall notice. Irons also responded to the allegation that he has breached his promise of transparency in the manner in which he has handled the potential firing of Lueker and Schultz. Irons also noted his consistent stance on a wastewater treatment plant project and the fact that building fees and taxes have not increased during his term. Opponents of Irons must gather signatures from 25 percent of registered Morro Bay voters to trigger a recall election. “Orators are most vehement when their cause is weak.” — Cicero. His actions Sept. 12 when he tried to fire the two in a “special” closed session and then had it blow up in his face was telling. It’s like putting a blindfold on a guy, a lit cigarette in his mouth and then standing him against a wall and saying, “Ready, Aim…” and fire never comes. It showed that he really didn’t know what he was doing; has zero compassion or scrupples; and his insistence that he was right and everyone else was wrong as to whether the Brown Act, Muni Code and government code were being followed correctly showed that he is both arrogant and that he is indeed being influenced by people on the outside. The follow up meeting when he admitted that he had already contacted three law firms regarding hiring them to deal with Lueker and Schultz shows he is discussing city business with outsiders. It also shows he thinks that the normal rules of conduct and limitations of power and authority written into the muni code don’t apply to him. Just exactly what did he ask/tell these outside firms about the city’spersonnel issues that he says he’s trying to protect? How did he have the authority to seek bids/quotes without any of it being done in a public setting? You call that transparency? As mayor, he doesn’t have any extra authority to go around the council and find his own firms, and yet he did it. I assume they want these lawyers to negotiate a settlement with the two employees. So that means they will now hire lawyers to protect their interests anf the whole thing can’t do anything BUT end up in court. That $12,500 they appropriated? Better add a zero before this is all done. He has before him now a hostile work environment in City Hall and indeed within every depaartment in the city. From the guy cutting the grass, to the recreation supervisor, a fire captain, and the special projects manager — that’s from top deep into the mid-level managementt of the city — spoke against him Sept. 12. There were also about 35 city employees who took vacation time from work to be there at the Vet’s Hall, and two members of the Planning Commission, and the chair of the Harbor Advisory Board also spoke against him, that to me is more than enough to convince me of degredation of the work environment in town. If he thought he wasn’t getting cooperation before, he’s got another thing coming. He better be walking on egg shells when he talks to any city employee from now on or he might find a job action being filed against him. And one piece of advice to his honor the mayor, don’t let yourself get caught alone with ANY of the women in City Hall behind a closed door ever again. As Mayor,isn’t he bound by some sort of law law to disclose any and all Ex parte contacts regarding city personnel? Another quote by Cicero. Fits Iron’s decisions to a tee. He did not “try to fire the two”. Oh no, he tried to dismiss them without cause. Wait….isn’t that the same as firing? He did not “try” to do anything that day. All part of the process. Bill Buckner is the DEVIL! Please don’t confuse us with facts. Niles most of what you said has merit. except the last part that was way out of line. Recalls are messy… divisive… and costly but recalls are a part of our political system. I think to make this recall into a left vs right endeavor is silly. Mayor Irons did something very unpopular in his town and the people have a right to call him on it. If he is steadfast in his decision then the people have a right to attempt a recall if they so choose. At least that is the way I remember it from civics 101. Maybe some of you could use a refresher course. “Recalls are messy… divisive… and costly”…and in this case NECESSARY. Of course they’re a part of our system, and a valuable one, but when they get used willy-nilly they lose their meaning and just become a means of payback. Making unpopular decisions is a part of leadership and unpopular decisions usually end up being good ones. If you want to call a politician on something, defeat him or her in the next election – that’s just my opinion – of course you can recall if you want to but it looks kind of silly micromanaging a city official you’re accusing of micromanaging. If you don’t think Right v. Left has anything to do with Morro Bay politics you either don’t live here or you never talk to anyone when they know the “other side” isn’t listening. It permeates everything. Thoughtful and well said…..Folks, please read Rambunctious comment again….. Most of us do not take this action lightly…..but in light of “Mayor Irons did something very unpopular in his town and the people have a right to call him on it”…..and especially when he was made most aware…and could have taken the high road…..and yet still wishes to spend extra funds that could be more judiciously used…..and also has “no cause” in his own words…..sadly he does not wish to lead in the best interest of the entire population of our town. This action has and is tearing our town apart…instead of being one to unite….as a statesman would do….he has decided to be stubborn and obstinate…..sadly…..
Why doesn’t the conservative right just let elected officials govern and then try to change things at election time? Do they have to recall and sabotage every individual that doesn’t do what they like. Our government is at the moment shut down because of these tactics. This recall process, if it should continue, would take about 8 months to implement and execute. You can’t control everything. Once the people speak, they speak and you have an opportunity at the next election to change course. I agree. Recalls and impeachments and such things are supposed to be reserved for extreme circumstances, not every time something doesn’t go your way. It’s why the right is losing a lot of relevancy both locally and nationally. Why do some posters have to make every freaking political question into a “liberal” v. “conservative,” “right v. left,” etc.? It is pure ignorance to make such artificial divisions because our political representation is so poor now that any traditional division lines are simply long gone. I believe recall is often the only option for whose whose elected politicians have pulled a bait-and-switch on them…promised one thing and delivered the other, or didn’t deliver anything at all. The reason we have this idiocracy running our country now is largely because voters are afraid to stand up to politicians and put the fear of the recall into them. As long as we allow these bait-and-switcher politicians to continue to screw us, without any consequences, they will, indeed, continue to sue us. I think it’s because one side is so ideological and sees everything in those terms and is so extreme. I mean, announcing they want a president to fail even before he starts? Recalling a guy in his 9th month on the job? “Bait and switch?” Come on. It would be nice if we could separate Morro Bay politics from national politics but unfortunately their tones are the same. Both sides would like “their guy” in there, even at the expense of what’s good for the town (or country), but one side has just become more ridiculous and irrational about it than the other. I think it’s ignorant to think such divisions are artificial. Reacall them ALL… from local to fed! I don’t believe we should recall them all. I do believe that the politicians who promised one thing and delivered another, the ones I call “bait-and-switchers,” should be recalled. It is the only way we will ever convince our elected politicians that, by God, they had better not promise us something at election time that they are not going to deliver if they are elected. Still no reasoning offered. Bad response. How is this statement going to sound eight months from now on the ballot? Another bad answer. Untrue. The mayor can call a special meeting without additional consent. What’s the rush? It’s almost as if someone has their eye on Irons’ seat, salivating at the thought of a successful recall. It would be a good time for someone with political aspirations to slip in there Arnold Schwarzenegger-style. Where did I say there is/should be a rush? Ask the proponents. Perhaps some people have less tolerance to being screwed over by their elected politicians than other people do. American politics has become a game of pure intolerance where anyone who doesn’t get their way (their team doesn’t win) can’t wait until the next election to rectify it. They are intolerant of the other team in any way shape or form and could care less about the job they might be doing. We all know this but we all go on talking like we care about the welfare of our community or country more than we do the power of our “side”. Everyone is in denial. You’re forgetting a couple names. Come on, we all know who they are. Foaming at the mouth, they are. 1. Ironic that the anti-Irons folks are worried about the cost of paying severances but not the cost of a recall election. 2. Mr. Irons is up for an election in June. How many months before that would the recall election be? Why not just defeat him in June? 3. The closed session meeting to discuss the termination of the City Manager and Attorney was just part of the process. The fact that no action was taken was not because of the public comment. 4. All those screaming for a “reason” for the probable termination of the City Manager and Attorney are not getting that termination “without cause” (even if there is cause) is often less costly and less painful for ALL involved. “With cause”, opens up the door for all kinds of litigation. 1. Any recall would likely coincide with the June ballot and would cost very little to a add to the ballot. 2. A June defeat would still leave him in office until December… with six months as an unaccountable lame duck to do damage. 3. A fine example of non-transparency with the public being in the dark as to what is going on. 4. So, you are saying Irons’ true reasons would get the city sued? Transparency’s great as long as it reveals what you want to see. Perhaps for some, but not for all. I believe voters have the right to transparency. It is the only way we can make sound decisions when we are in the voting booth.